Norah Dooley is the funny and frenetic force behind massmouth, which has produced six seasons of competitive story slams in and around Boston. CAMBRIDGE — As the crowd settled in last week at Club Passim, Norah Dooley, the indefatigable director of the homegrown storytelling group massmouth, took to the stage to regale her audience with a tale of birth, thirst, rodents, and death. It was vintage Dooley, the funny and frenetic force behind massmouth, her storytelling group that by dint of volunteer labor, small grants, and (only occasionally) remuneration has produced some six seasons of competitive story slams in and around Boston. work independently with StoriesLive, the program she created to bring storytelling into area schools. Her days with massmouth may be numbered. Onstage, however, Dooley didn’t let up as she described trapping the rat in a box and ferrying it to the alley. Cofounded in 2008 with Andrea Lovett, Stu Mendleson, and Doria Hughes, massmouth was formed during the recession, when Dooley found herself out of work teaching. Come they did, and for years massmouth has been holding slams at venues like Club Passim, where tellers vie for a chance to enter the “Big Mouth Off,” the group’s culminating event held each April at Coolidge Corner Theatre. Storytelling, of course, is as old as civilization. In Boston, however, many storytellers trace their roots to Hugh Hill, the iconic raconteur known as Brother Blue who died in 2009. Today, the city is home to several such storytelling groups, everything from big outfits such as The Moth, to smaller organizations such as the Story Space and Birth Story Slam. The Passim crowd was certainly on its toes last week as Dooley described chasing the rat out of the box, that big piece of wood held aloft in her hand. Storytelling events like this one, though well-attended, are only part of massmouth’s mission. The other, which Dooley plans to take with her, is StoriesLive, which she says has introduced more than 7,000 students to storytelling and awarded more than $22,000 in scholarships. Nevertheless, funding has always been a challenge. The organization has attracted only a handful of grants over the years from agencies such as the Massachusetts Cultural Council and Mass Humanities, and Dooley said she’s never been paid a salary. 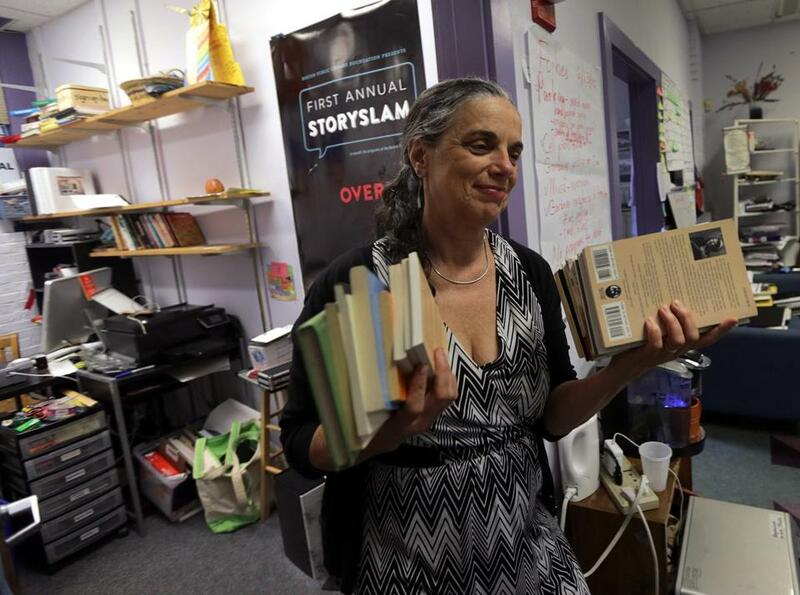 Now that her husband is retiring, however, Dooley said she hopes to help support them by resuming some of the freelance work (storytelling, teaching, and writing children’s books) that she has neglected while working with massmouth. Perhaps. But nowhere near as ridiculous as the story unspooling onstage, where, after slaying the giant rat, Dooley ventured into the basement to do some laundry. “And there, right next to the dryer, were 12 little rat-lings — a nest of rats,” she hissed as the audience squirmed. 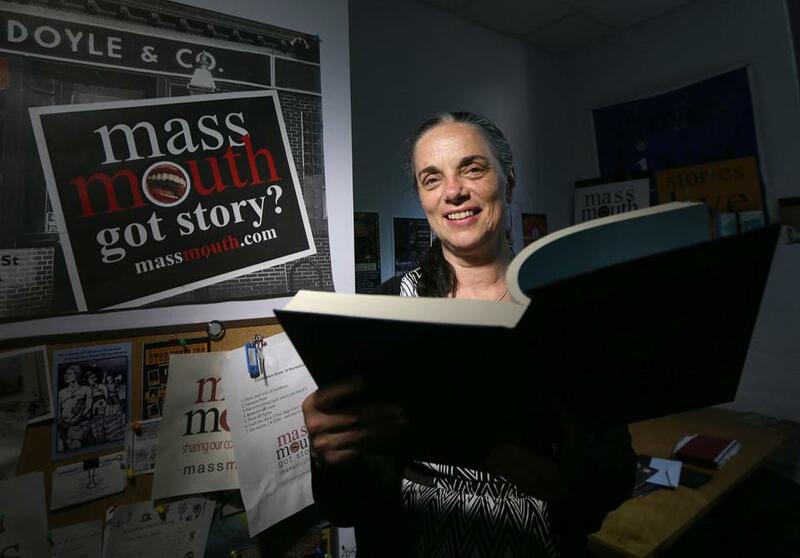 It was stories like this one that prompted her fellow storytellers to step forward when word leaked that Dooley planned to retire from massmouth, possibly closing the organization. The new leadership group, all of whom have outside jobs, promises a competitive slam season starting in September, as well as an ongoing collaboration with the Riot Theater in Jamaica Plain. “One of our goals,” she said, “is to be a network for storytelling.” Another, she added, is to diversify the group’s storytelling pool. No doubt, Dooley — who ended up calling an exterminator for those baby rats — will be a hard act to follow. The crowd erupted in a collective blech. Clearly, her work here was done. After packing up at mass-mouth, Norah Dooley plans to resume some of the storytelling, teaching, and writing that she neglected while at the nonprofit. Malcolm Gay can be reached at malcolm.gay@globe.com. Follow him on Twitter at @malcolmgay..